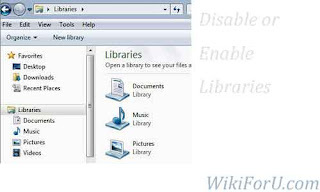 Windows 7 has a built in Feature of Libraries that contains All your documents, music files, videos, contacts, downloads etc. It provides quick access to all above folders and files to a user. But some users don't like this new feature and want to remove it. If are the one of them then here is a good news for you. Now you can remove Libraries from your Computer or Windows 7 in a number of clicks. It is very easy to do this job. If by mistake you have removed libraries and want them again then you can also do that with just a click. It is pretty simple. Just Download This Registry File. 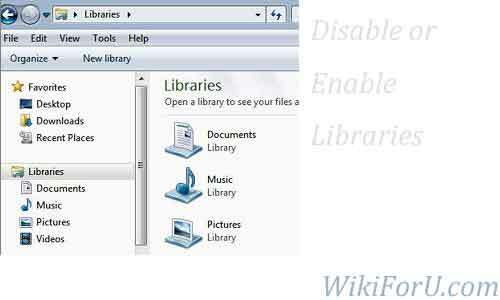 If you want to remove Libraries then Click on Disable Libraries. If you want them again then Simply double click on Enable Libraries File. Isn't it so simple and fast. If you want to do this manually with registry hack, then you can also do that. But as it includes so many difficult steps therefore chances of mistakes are more. So why we take risk. Download above files and enjoy this hack without Using any commands or doing any registry editing.